Derived from nature and perfected by science, this Red Sparkling Butterfly features a glamorous butterfly painted in red enamel and offset with sparkling background. The link made from nickel-free stainless steel provides a perfect support for an image adorned and captured in gold enamel. We provide you with all kinds of butterflies to satisfy the most sophisticated demands. 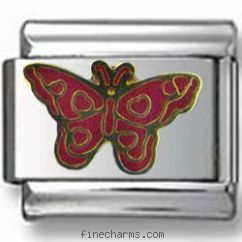 Mix with our Pink, Purple or White and Brown Butterfly Italian charms for a botanical complex of charms!